Dragon Ball Fusions - FUUUUUUUSION-HA! Have you ever found yourself watching Dragon Ball Z and thought "Man, it'd be so cool if these two characters fused"? 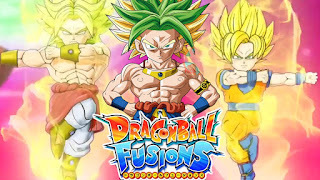 Well, look no further because Dragon Ball Fusions caters to all of our what if fusion needs. Read on as I explain why I'm excited for this, and you should be too! In the game we get to travel around the world of Dragon Ball, recruiting new characters to fight alongside us against classic Dragon Ball villains such as Raditz, Frieza and Cell. I know what you're thinking: "But Dan, Dragon Ball Fusions is already out in Japan so this is old news" and to that I say that this is now all relevant to us as it has been announced that Dragon Ball Fusions is coming to Europe and America. So if you've ever wanted to fuse your two favourite characters together, now you can. Let's look at an example, shall we? This screenshot here shows Karoly, a new character made up of Goku/Kakarot and Broly the Legendary Super Saiyan, who appear to have fused together via the fusion dance. I'm actually very surprised at this one as anyone who knows Broly knows that he absolutely hates Goku for his constant crying as a baby, it drove him insane! (Honestly, I think Broku sounds a bit better, but it is what it is.) Karoly seems to be a middle ground between Goku and Broly in terms of bulkiness, he has a combination of both their hair colours, but mostly seems to resemble Broly overall. I love the idea of just being able to fuse practically whoever we want together. I've always liked the 'What-if' scenarios of Dragon Ball that they usually have in the games. Such previous 'What-if' fusions include Tiencha and Gokule. Which are Tien and Yamcha and Goku and Hercule, respectively. One of the noticeable things from the trailer is seeing a green Great Ape which can only be Broly. As someone who absolutely loves the ridiculous scenarios they come up with, I'm really looking forward to this game. As far as I'm aware, it doesn't appear to include any GT characters as of yet, but does include Super characters such as Beerus and Whis, who even have a fusion together. Towards the end of the trailer, we see not two, but five characters performing the fusion dance to create one massively strong character! Now, I'm not sure if the blue in his hair has anything to do with the actual Super Saiyan Blue form, but at this time we can only speculate. Dragon Ball Fusions will be released in North America on December 13th 2016 and Europe in February 2017.